The garage door opener, an Overhead Door Legacy� model, attaches to the ceiling and door with steel channels. The door is wired to an opener next to the garages rear door that enters the house. The garage door opener features a pull-cord that will disconnect the motor from the door so that it can be opened manually in case of a power loss. Two motion sensors are placed about 4 inches from the floor on both sides of the garage door opening to prevent the door from closing on anyone entering the garage as a safety measure. If you are in the market for a garage door opener, there are a few things to consider. Your options include the type of drive, speed, motor power and security. You can find one that has the best features for a reasonable price. However, you will not be choosing mainly based on the price. You should also look at the type of garage door that you have. Here is an overview of the available types. The garage door openers differ from each other mainly based on the drive. There are four main types of drives for garage door openers namely chain, screw, torsion and belt. The chain drive uses a chain for the track to open and close the door. A chain drive's benefit is its price. It is cheaply priced. The disadvantage is that it needs regular maintenance such as adjustments because the chain can be stretched with regular usage. Another disadvantage is that chain drives can be quite noisy. The screw drives use a threaded shaft, which turns to pull the door horizontally. When compared with chain drives, the screw drives are more expensive, but require less maintenance and produce less noise. The belt drives use a rubber belt for opening and closing the garage door. This drive's advantage is it makes very little noise. The disadvantage is that it costs more than the garage door openers with chain and screw drives. The torsion drives, like belt drives, do not give problems regarding noise. It makes use of torsion springs. Another advantage of torsion drives is that it is suitable for garages with low ceilings. The disadvantage is that it costs a lot more than the other types. You should also consider the speed of the door opener especially if you are the kind of person who always rushes to get out of the garage every day. You can compare the speed of garage door openers during testing prior to purchase. Regarding motor power, one can choose between alternating current (AC) and direct current. Both AC and DC are a good choice but if you are the individual who hates noise, you would prefer DC motors for garage door openers. When choosing the motor power, you need to consider the weight and size of your door. You can choose from a third, half and three-quarter horsepower. They are the standard options. A third horsepower will be enough for a single door garage. 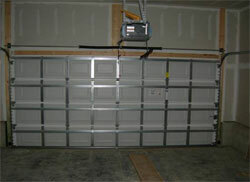 You can start at half horsepower if you have a two doors or a single but wider garage door. The safety and security features of garage door openers are almost the same. Most garage door openers utilize keyless entry systems. Some door openers also come with remote controls. Newer models come with rolling access codes. It is an improved access code system wherein the codes change every time the remote control is used. It gives a high level of security. In some stores, you will be able to find a garage door opener that can be programmed to not open on certain dates. This modern security system is designed for homeowners who go on vacation for a long period. Also, the garage door may be installed in a summer home or second house. For safety, you may consider getting garage door openers that can be manually adjusted or reversed when the door closes while someone or something is about to pass. In addition to this safety measure, the garage door openers are required to have eye sensors at the bottom of the door to avoid accidentally closing the doors when there are animals or children that are about to pass. You can also consider getting garage door openers that come with lighting systems. They are great for avoiding accidents of accidentally closing the door on someone because the light will serve as a warning. The light will stay illuminated for a few minutes for you to safely enter your home. Garage door openers have come a long way. It was not long ago that most people had to manually lift their garage door, back out and get out of their car to shut their garage every time they left the house. It would be wise to visit your local building supply store to explore all of the options that are available. With all of the choices available, you are sure to find one that best suits your budget and needs.